↑ Magill, Frank N. (2003). The Ancient World: Dictionary of World Biography, Volume 1. Routledge. p. 226. ISBN 1135457409. ↑ "History of Latin Literature". HistoryWorld. Retrieved December 5, 2016. ↑ Aloy, Daniel (May 22, 2008). 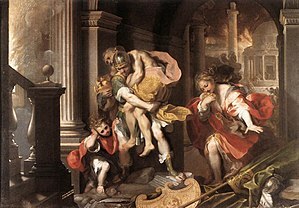 "New translation of 'Aeneid' restores Virgil's wordplay and original meter". Cornell Chronicle. Retrieved December 5, 2016. ↑ Damen, Mark (2004). "Chapter 11: Vergil and The Aeneid". Retrieved December 5, 2016. ↑ Gill, N. S. "Why Read the Aeneid in Latin?". About.com. Retrieved December 5, 2016.